I don’t know how much longer I’m going to be able to get away with this NOT camping thing. My little girl really wants to go spend a few nights in the woods and now that there are gadgets that you can cook on, keep away the bugs with and charge all your electronics with even when you’re in the wilderness, I’m running out of excuses.. at least I still have the sleeping on the ground argument, don’t I? 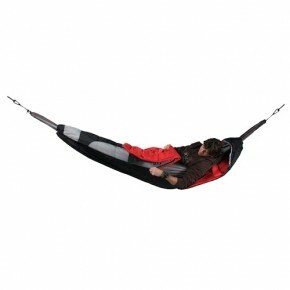 Not at all, welcome Brand Trunk’s new Hammock Compatible Sleeping Bag, made of a nylon shell with warm and cozy thinsulate fill this handy item gets you up and off the ground by wrapping around a hammock, thus keeping the base fill from compressing beneath you and your back from freezing, and it get’s you up and above pesky rocks and sticks that can make your slumber a living nightmare. draft collar and an adjustable-mummy type opening, it also has an interior zip pocket so you can store a few goodies beside you and not have to climb in and out once you’re all warm and cozy up in the trees.